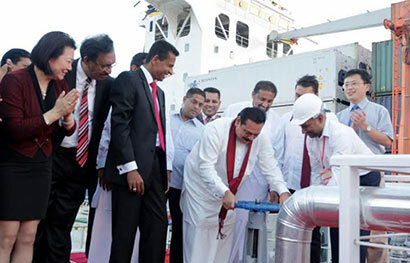 President Mahinda Rajapaksa opened the Fuel Bunkering Terminal and Storage Facility at the Magam Ruhunupura Mahinda Rajapaksa Port (MRMRP) on Sunday (22) evening. The tank farm owned by Sri Lanka Ports Authority (SLPA) consists of 14 tanks and eight of them are used by the SLPA for bunkering. The total bunker capacity is 51,000 cubic metres and the capacity for aviation fuel and LP gas are 23,000 and 6,000 cubic metres respectively. The SLPA has invested $ 76 million in constructing the tank farm and bunkering infrastructure that includes offshore bunkering facilities. After the opening President Rajapaksa exchanged greeted the large crowd gathered to witness the occasion. Ministers Rohitha Abeygunawardena, Anura Priyadharshana Yapa, Mahinda Yapa Abeywardena, Pavithra Wanniarachchi, MP Namal Rajapaksa, Uva Province Chief Minister Shashendra Rajapaksa, President’s Chief of Staff Gamini Senerath and Sri Lanka Ports Authority Chairman Dr. Priyath Bandu Wickrama were also present on the occasion.